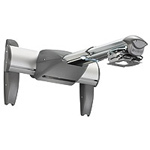 Peerless PRG Precision Gear Universal Projector Mount is simplifying the way image alignment is done. The patent-pending precision gear design allows exact tilt and roll image positioning by either simply turning two adjustment knobs with a Phillips screw driver, or use the tool-less option by extending the knobs to adjust by hand. Just set the precision gear to the desired position to secure it in place it will hold its position even during projector maintenance. 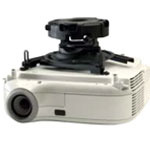 With Peerless PRG Precision Gear Projector Mount, just set it and forget it. No more adjustment screws. No more micro adjustments. No more hassles. Only $139. Chief's revolutionary new Interactive Projector Wall Mount will transform your current short throw projector into an interactive, collaborative communication machine. No special board required. Make notes and interact with your presentation and share it over the internet. The mount works with Windows and Mac operating systems and integrates seamlessly with existing applications. From $1,239. 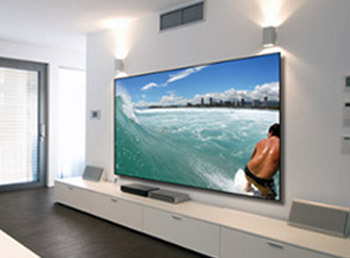 Black Diamond Zero Edge is the first affordable large flat-panel alternative, in custom diagonal sizes up to 142". The Zero Edge ultra-thin rigid panel sets a new aesthetic standard - with a pencil-thin bezel, the projected image appears to float off the wall. Among the multiple mounting options include recessed (unframed), flush-to, projected off the wall, or flying from cables for an incredibly sleek appearance. There's no assembly required - just unpack and hang. Black Diamond Zero Edge coupled with the new Black Diamond G3 screen materials offers the most cutting edge screen technology money can buy. Comprehensive Pro AV/IT cables are constructed using a true professional grade 99.9% High Purity copper 26 awg center conductor that is significantly more robust and durable than traditional HDMI cables. This along with a premium low capacitance dielectric translates to up to 15Gbps @ 3 Meters which is up to 50% higher and faster than traditional HDMI cables at that length. Comprehensive's exclusive ProGrip connector tightly secures the connection with up to 16lbs of retention force to prevent cables from being unintentionally disconnected. 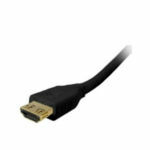 Pro AV/IT Series HDMI cables support all the latest in HDMI technology including 3D, Ethernet Capability for networking, Deep Color, Dolby True HD and DTS-HD Master audio, audio return channel, and support for beyond 1080p 2K x 4K resolution.